Honestly, one virus can be walking around the aisles of san airplane, and it would befriend me. That's because I'm special. Usually a pre-flight doze of Airborne takes care of that and puts an end to the flourishing friendship, but this time I was too lazy/tired/nauseous and decided to skip it. So, while no jetlag was in stock for me, I'm imprisoned at home with a nasty cold for the last 5 days. Portugal was charming, beautiful and unassuming, lovely people and incomprehensible language. And I absolutely fell in love with it all. I took lots and lots of photos, did quite a few sketches and came back with plenty of inspiration and a few extra kilos, as the food is so wonderful. It might be blogged, probably some of it will show in my future paintings. If I could come up with the ultimate photo that would represent this enchanting country, it would show a very narrow alley with steep stairs leading up to a red-roofed white washed house with blue-n-white tiles on one of its walls, where an old woman in black is looking out of a window under which a picturesque laundry line is waving in the wind, a street lamp nearby, a castle in the background as well as a cathedral, and intricate black and white mosaics on the cobbled-stoned pavement. Behind that woman, there will be a table with sardines and bachalau (cod fish) and pastries galore. near a cup of bica (the wonderfully strong Portuguese coffee) and a narrow glass of freshly squeezed orange juice. Oh, and a loquat tree. And three old men sitting on a bench. Clearly, this photo exists in my mind only, but it's quite a good one! 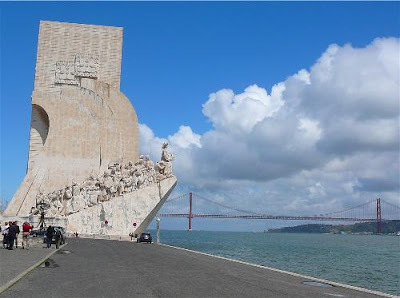 For now, from underneath heaps of cups of tea and Dayquil, and until I get back to a painting and blogging state, I'll leave you with a photo I took in one of my favorite places in Portugal: the truly impressive monolithic Discoveries Monument in Belém, Lisbon. Oh, and if the bridge on the right looks familiar, that's because it's a cousin of the Golden Gate Bridge in San Francisco (both constrcuted by the same company). Thoroughly enjoyable rendition of your journey. Welcome back! Get well soon so we can see and hear more about your Portugal adventures. PS - you're finger crossing worked! Sounds like the journey was almost worth the lousy cold you got. Hope you're feeling better and have a good weekend. Portugal is on my 'must see' list, and with your imaginery photo in my head, I KNOW I want to go there. You need a hot cup of that strong coffee to make you all better. Wow, you packed a lot in that photo in your mind, Nava :) Hope you are well again very soon and share some of your favorite sketches from the trip. Hi, You difinitely need a 'Poor Fuzzy Diddums'!! Never mind, the paintings will be simmering on the back burner of your mind........along with the virus - so soon they'll both be out, I bet!! Robert, welcome to my blog. FoodieP, Glad my fingers worked - can I uncross them now? Sandy, Oh, it was worth it big time. I hope to get to Portugal soon - it really is something different! Holly, I also wonder how this trip will affect my brush. What a wonderful endorsement for Portugal, and less so for flying. You know you need chicken soup, don't you? Not to make, but to eat. I believe the new science suggests soup, hot tea with honey, and reading blogs in bed until well. That's an astonishing monument - beautiful, and I didn't know the Golden Gate had a cousin. Get well soon and do some paintings to illustrate your journey. Bonnie, I loyally followed modern science: chicken soup (well, Thai coconut soup with chicken also counts), AND the tea with honey AND the blogs. It seems to have worked! Blueberry, it is astonishing - I was truly impressed. Bill, Thanks. And, illustration process has been launched, as you can see. Formerly a hi-tech engineer, now an emerging artist on the quest for my own voice. People are my favorite subject matter, and I am always on the hunt with my camera, pencil or sable brush. The content on all pages and sub-pages of this blog is © Copyright 2006-2009 by Nava Attia-Benoit. No text, photos or images may be reproduced elsewhere in any way, without express written permission of the copyright owner.